A WaterWatch® alarm is designed to sound off like a smoke detector when water gets where it doesn't belong. Powered by a standard battery, a WaterWatch® alarm will provide an early alert that can help you avert a damaging flood in your basement or crawl space. The WaterWatch® sump pump alarm is included with any new sump pump system installed by your local dealer. This specialized alarm rests on top of the airtight sump pump cover, and has a probe that extends down into the sump liner. If water level in liner rises above the level where pumping normally begins, the WaterWatch® alarm will sound. 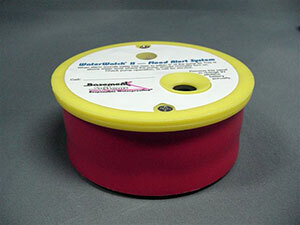 WaterWatch® floor model alerts if there's a plumbing leak or water on the floor. Your sump pump WaterWatch® alarm prompts action to correct a sump pump malfunction. The power supply to your sump pump may have been interrupted by a tripped circuit breaker or a downed power line. Pumping can also be compromised if an intake port is blocked with sediment or a large object. Whatever the reason, your WaterWatch® alarm improves your chances of avoiding a basement flood. For additional flood protection, you also have the option to install the WaterWatch® floor alarm. This alarm sits on the basement or crawl space floor, and when positioned next to a water heater, water tank or clothes washing machine, this alarm provides an instant alert if there's a plumbing leak or overflow. In addition to water alarms, Basement Systems offers several sump pump features that are designed to make sure your sump pump is functioning like it should, keeping your basement dry! 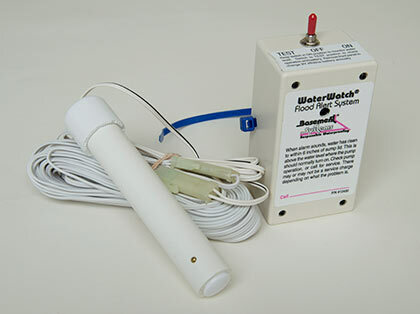 The WaterWatch® alarm is an exclusive feature of Basement Systems' sump pump systems. Call us at 1-800-638-7048 to schedule a consultation with your local dealer and get a free estimate to install a new sump pump in your home.